...that the UNSC Department of Commercial Shipping operates a large fleet of mostly unmanned freighters? ...that the Covenant's founding document was known as the Writ of Union? ...that attempting to create an account in Halo: Combat Evolved called ".fortune" will trigger the appearance of a fortune-cookie-like phrase? The Halo 3 Limited Edition is a limited edition of Halo 3. It has additional content than the standard edition, yet less extra content than the Halo 3 Legendary Edition. Like the standard, it has the regular main game disk along with additional features. Has a three-way folding steel container. Bestiarum: A hard cover, bound collection of information and art covering the species, cultures and civilizations of Halo 3. A relatively small poster of the Master Chief and the Arbiter. An illuminating collection of original "Halo 3" storyboard art from artist Lee Wilson, depicting key moments and pivotal scenes from the epic cinematic production of "Halo." 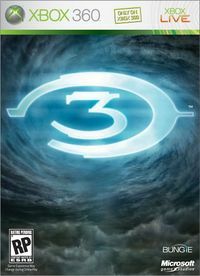 An extra disc that contains exclusive, behind-the-scenes footage and videos, a high-definition "Making of 'Halo 3'", a documentary showcasing the Bungie team and its effort to create the most anticipated title in the industry's history, numerous high-definition featurettes documenting the creative design processes involved in developing the game; and a look at some early game concepts and their evolution through the game's development. The extra disc contains an audio-visual calibration tool. The Collector's Edition is notorious for its poorly designed disc holder, which have caused many discs to pop out during transit and being scratched to the point of becoming unplayable. Microsoft estimated that about 30% of Collector's Editions were affected by this problem.